Non-purulent skin and soft tissue infections (SSTIs; i.e. cellulitis or erysipelas) account for up to 3% of all emergency department (ED) visits. Once the diagnosis of a non-purulent SSTI is made, the emergency physician must select the appropriate antibiotic agent, dose, duration and route (oral or intravenous (IV)). Current guidelines regarding the optimal route of therapy are based on expert opinion due to a lack of high-quality evidence. Selecting the appropriate antibiotic route for outpatient management is a key decision point. Oral antibiotics hold several advantages over their IV counterparts: cheaper, less invasive, lower risk of complications and increased patient convenience and comfort. The main advantage of the IV route is 100% bioavailability, which is useful in patients who have vomiting or a gastrointestinal malabsorptive disorder. 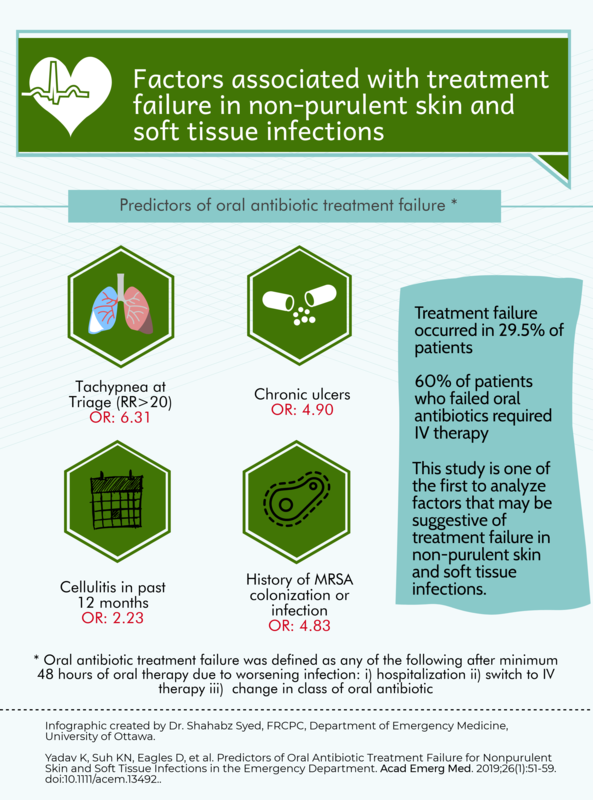 There are no studies that have examined predictors of failure with oral antibiotic therapy. Identifying such predictors would help clinician better select which outpatients require IV therapy from the outset. We conducted a health records review of 500 adult ED patients to identify risk factors associated with oral antibiotic treatment failure for non-purulent SSTIs. There are currently no validated definitions of treatment failure. After reviewing the literature and discussion among local experts in infectious disease and emergency medicine, we arrived upon a consensus definition. Oral antibiotic treatment failure was defined as any of the following outcomes occurring after a minimum of 48 hours of oral antibiotics and at no later than 14 days from the index ED visit: 1) subsequent hospital admission; 2) change in antibiotic route from oral to IV; 3) change in class of oral antibiotic. Any of these criteria must have been due to the SSTI. This is the first study to evaluate predictors of oral antibiotic treatment failure for adults with non-purulent SSTIs who present to the ED. 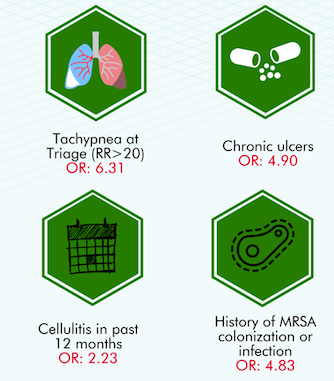 The identified risk factors (tachypnea at triage, chronic ulcers, MRSA history or cellulitis in the preceding year) should be considered by emergency physicians when deciding on the optimal route of therapy. Future studies should be done to prospectively assess these potential risk factors for treatment failure and ultimately derive a clinical decision rule to guide emergency physicians on the optimal route of antimicrobial therapy. 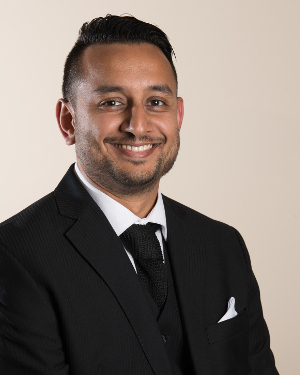 Dr. Krishan Yadav is an FRCPC Emergency Medicine Physician, and Epidemiologist with a special interest in non-purulent skin and soft tissue infectious disease. 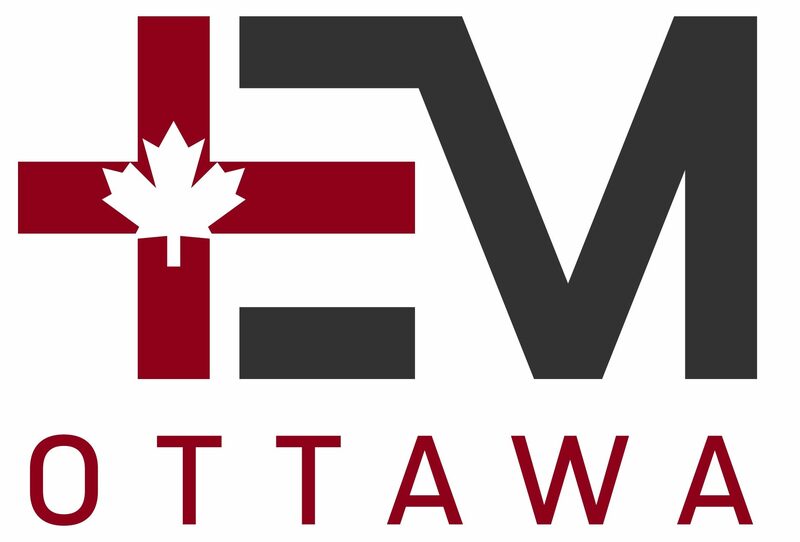 Dr. Syed is an staff Emergency physician at the Ottawa Hospital, with an fellowship in Digital Scholarship and special interests in rational resource utilization.